It’s the latest photography fad. You find out that there’s a field of sunflowers somewhere, and it’s within your driving distance. Oh, how fantastic a photo that would be. So you jump in your car and you drive to the sunflower field. Oh, these would make great photos, you think to yourself. You get there, and you find out that seventy other people have the same idea as you. So you and 70 of your photo buddies trespass onto the sunflower garden, and you take photos and you traipse over here and you wander over there … possibly unaware that the sunflower field was private property, that the sunflowers were being grown for agricultural purposes, maybe to extract the oils or seeds for commercial or food products. Yeah, but you don’t care. You want that picture of sunflowers as far as the eye can see. You want that shot of your kid playing in the sunflower garden. Instagram will eat this up like chocolate cake. Okay. Stop now. Here’s a news story from Toronto of an Ontario farm that opened their sunflower garden to a few photographers – only to have their fields overrun by thousands of shutterbugs. I will admit, I’d love to get some shots of sunflowers. But I’m not going to march onto private property for that shot. Come up to the monitor. Yes. Someone in my neighborhood planted sunflowers around his house. And they’re right on the sidewalk, where anyone can photograph them up close and personal. Heck, I didn’t even HAVE to get out of my car, the sunflower garden is only a few blocks from my front door. I walked over there … and lo and behold, a bumblebee is laboring, minding his own bzzzness. I think I can get a good shot. How about seeing what a sunflower looks like in infrared? Infrared sunflower. Rolleiflex Automat MX camera, CIR 120 color infrared film with yellow filter. Photo (c) Chuck Miller, all rights reserved. Yep. 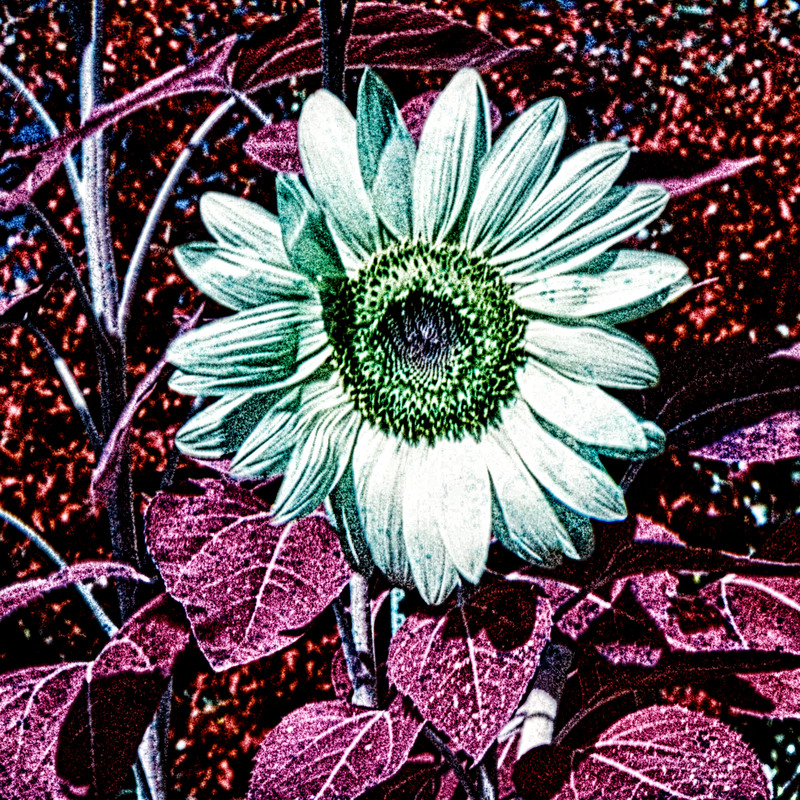 In infrared, yellow sunflower petals turn white, while the leaves become a magenta red. Dang. But see, here’s the thing. If you want sunflowers of your own, there’s an easy way to do this. Get some seeds and plant them. Plant them in an area that would get lots of sunshine. Water the plants as necessary. And next year, you’ll have stalks of big bright sunflowers in your garden, and you can photograph them every day. Or if you do know someone who has a sunflower garden, and is willing to let you onto his/her property to photograph these beauties … have some common courtesy. Despite their intimidating size, sunflower plants are very delicate and can be damaged easily. Stay in designated areas, and don’t “pick” the sunflower heads as personal gifts to bring back home. If you’re that desperate for some sunflower tabletop beauty, go to the florist and get some Gerbera daisies, it’ll work out just as well. And if you are successful in photogrpahing sunflowers in a farmer’s field, and he did give you permission to do so, thank the farmer and offer a donation, either to the farm or to a charity in the farmer’s name. They’ve closed their sunflower field to photographers. Forever. Don’t be the guy who causes this to happen and ruins it for everybody else. Be respectful. And if you can’t find a sunflower grove … plant your own stalks and just wait. We have critters that dig up our seeds and eat them!